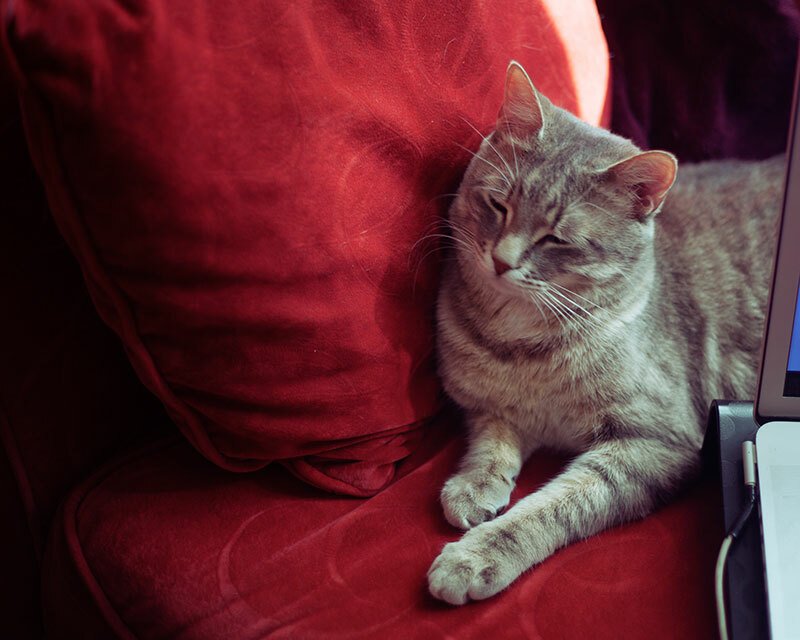 If you’re a cat owner on the hunt for a new sofa, finding the right one can be a pretty difficult task. While you may be extremely picky about the aesthetics of your furnishings, at the back of your mind, you probably realize even if you find the ideal couch for you – it may not be the perfect fit for the daily challenges of life with a cat. That’s why I personally find it’s easier to start by figuring out which couch materials fit your specific needs as a cat owner best, then looking within those constraints for an ideal couch aesthetically. 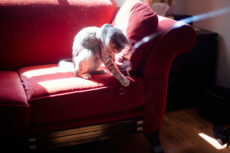 While there’s obviously no such thing as a completely cat proof couch, there are, in my opinion, four really solid options when it comes to couch material choice, and this is typically the most important factor in durability and longevity of furniture when you’ve got a clawed furry under your roof. 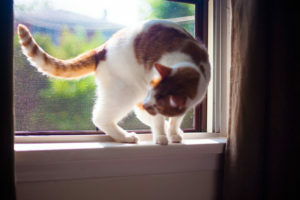 Unfortunately, the best materials for withstanding cat scratches are not the same materials that will do best at withstanding washroom or sensitive stomach related accidents that may take place. 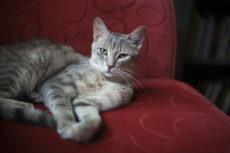 The top materials for repelling fur, similarly, don’t do the absolute best job at holding up if cats are aggressive around sofas and likely to claw up human furniture. 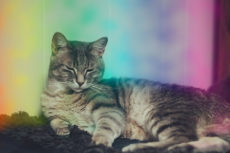 Each and every cat is different – and the struggles you’re likely to face day to day will reflect that – so it’s important for you to figure out which benefits you prefer to reap from the material choice you’re going to make. 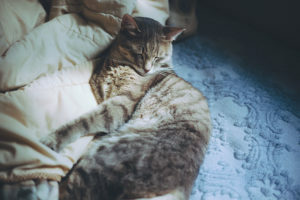 One thing to keep in mind: you can do a lot to minimize the chance your cat will scratch up furniture, but in my opinion it’s a lot harder to prevent accidents, spills, and general clean up from taking place. I’ll get more into how you can minimize furniture scratching later in case this is something you’re interested in trying to tackle. If you do manage to succeed, at that point you have a lot less to worry about, and two solid top picks for material choice, but more on that in a bit. 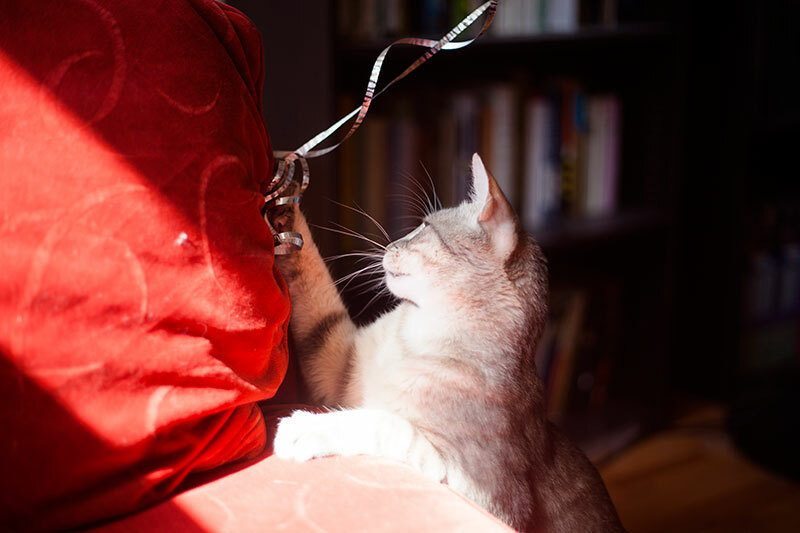 Again, while there’s no perfectly cat proof couch, there’s a lot you can do to minimize the amount of wear and tear you’ll get from a healthy dose of whiskered shenanigans over the years. Leather is probably the best overall material to grab a sofa in if you’ve got a cat who scratches, spills, and produces a lot of furry tumbleweed (as all cats with hair do, even the short hair kinds like my Avery; let’s be frank, they’re basically fur-making machines!). Leather is excellent at not holding on to fur, is really easy to clean, and is not too shabby when it comes to cat scratches either. 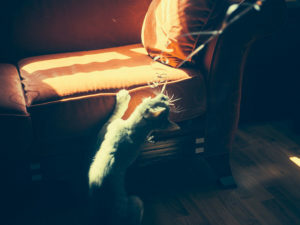 It’s not ideal when it comes to handling scratches (that award goes to the material in spot #3 on this list), but it’s nowhere near the worst, and for the most part, cats don’t prefer to scratch up leather over other materials, so that may help your sofa stay safe in and of itself. The potential downsides to leather besides not holding up the best to scratches? It takes a bit of maintaining (ideally, you’d condition the sofa every year or so), and while it’s easy to clean, you also have to be a little careful with what you use to clean it, seeing as how if you dry out leather you’re increasing the likelihood it’s going to crack, and that is not ideal for the sofa’s longevity. Leather’s also not an ideal couch material to have if you want to place your furniture in sunny spots, as sun damage is it’s kryptonite to leather. But so long as you’re willing to put the effort in, and work around its limitations, leather is an amazingly resilient material for cat owners. Pleather is incredibly easy to clean, even easier than leather (since you don’t have to be so picky about what you clean pleather with – there’s no need to worry about drying out plastic!). It’s just like leather when it comes to repelling cat fur – plain doesn’t hold on to the fluffy stuff. The one downfall it has that results in leather being one spot ahead in the lead? Cat scratches are pretty much the death of even an excellent faux leather. 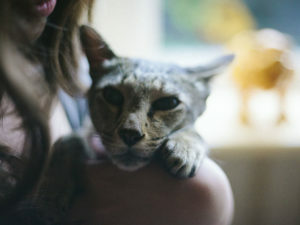 But if your cat has no interest in scratching up furniture, or if pleather just isn’t his or her thing to take your claws to – pleather is almost certainly the best bet. Another benefit? Overall durability of faux leather is higher than leather. This is up for debate on the net, as many people insist the durability of leather is much greater than fake leather’s durability. To my knowledge, if you end up grabbing a high quality pleather sofa, it has to be much more durable in terms of wear and tear over time than real leather (again, it’s plastic after all, and plastic if nothing if not durable), but with a cheap quality faux leather on your hands, leather will likely win the battle. Lots of reason to choose between one of these two options, but if you’re only fixated on kicking the couch shredding via cat scratches, you’re going to want to choose option #3. When Thomas and I first took Avery in, we had a red velvet sofa in our house that Avery loved to take his claws to (yes, it’s the one in all these pictures). The thing is, I absolutely never noticed any scratch marks or damage afterward. I’m not sure if this is the magic of all velvet, or if only high quality velvets can withstand this kind of clawing, but either way, my experience left me plenty impressed with the stuff. I can’t promise velvet will withstand all scratching with no damage. 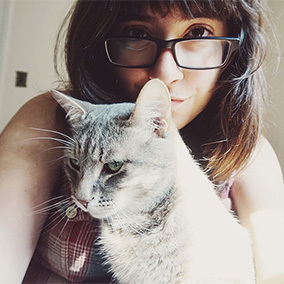 I’ve only ever had one cat (thus far!) and maybe if I had 5-6 for around a decade, I’d see a lot more of the material’s true colours, but I’m pretty convinced if it isn’t completely scratch-proof, it’s at least one of the best or the outright best sofa material when it comes to weathering cat scratches. Please let me know if you have any firsthand experience with velvet + cat claws in the comments down below, and how you feel it does on the scratch-resistance scale. When it comes to repelling cat fur – velvet is also quite good in my eyes. It does get a little hairy, but not quite as often as other fabric sofas, and it’s from my experience much easier to remove fur from velvet when it does accumulate. You know those red lint remover brushes that are crazy good at removing pet hair? They’re made of velour, which is a mass produced, cheaper to create alternative to velvet. I find it pretty easy to slide the hair off of those, and the same was true of my velvet couch. Pretty neat if you ask me. If you absolutely want a fabric couch and either don’t want velvet or can’t seem to find one made of velvet that’s in a size or style you want, opt for a microfiber couch for an option that will hold up well to scratches. The higher quality the microfiber, the better it should hold up to scratches, but unfortunately, my guess is it won’t be very easy to tell which microfibers are better than others (I know I can’t tell!). Still, I have a feeling any microfiber is better than most fabric options besides velvet, so at least there’s that. Please correct me in the comments down below if I am wrong. Microfiber isn’t the greatest at repelling fur, being easy to clean, or being less desirable for cats to want to claw up in comparison to the other options on this list, so in my opinion, while it still makes the cut, it does just barely, and the other three couch materials are by far superior and in a way higher league than microfiber when it comes to fending off the cat owner daily struggles. I promised I’d touch on this topic back in the intro, so here’s my advice. 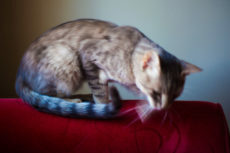 It is possible to train cats to stop scratching furniture – but it takes time and effort on your part to do. Worth it? In my opinion, absolutely. 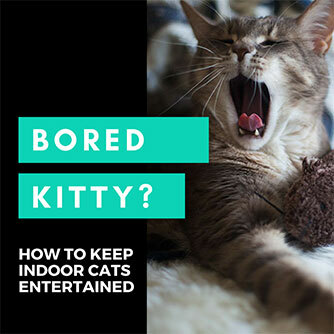 And if you need one, here’s a full how-to guide to training cats to stop clawing furniture. Besides that? The ideal is to have a scratching post, scratch pad, or cat tree in every room your cat frequents. That way, when he or she gets the itch, there’s a cat-appropriate object to take nails to immediately within the vicinity. 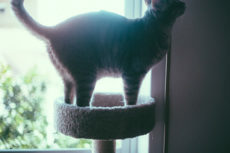 Top choices include these inexpensive cat trees, as well as small cat tree varieties that are much cheaper than taller trees. Space an issue, even though you’d love to go big? Try narrow cat trees, or if you’re in a really small apartment, try a floor-to-ceiling variety. Though you have to drill into the ceiling and the floor to get one of those up, they’re really affordable and look super sleek and modern as well. Hate seeing cat stuff everywhere? There’s a fix – have a bunch of scratch-approved human objects like these around for your kitty to claw on. Some examples? Rugs – because let’s be honest, those are a lot easier and cheaper to replace than couches. Want to protect your sofa from the get go or even make old, scratched up furniture look like new? There are a slew of cat scratch furniture protectors on the market. Of the many types, if you go the couch protector cover route, you’re sure to find at least one that will do the trick for you no matter how picky you are aesthetically. Cat only care for scratching up specific parts of the couch? Don’t want to fight the itch to scratch? Try a couch cat scratcher instead. 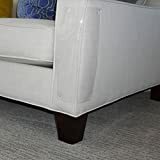 Or if you’d rather go the training route, but in the meantime, want to protect specific parts of your sofa from kitty claws, best temporary solution is likely grabbing a scratch protector guard like this pin on one for fabric sofas from Furniture Defender or this self-adhesive tape for leather sofas from Sofisti-Cat. They work like a charm for their intended purpose. Your Thoughts on Couch Materials for Cat Owners? 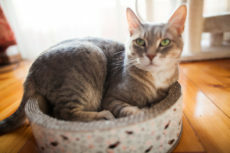 What furniture materials do you think are ideal for cat owners? Do you prefer to have materials that are fur repellent? Ones that makes accidents easy to clean up? Ones that hold up to scratches best? Is there a type of fabric you would never entertain getting? One you’ve been using that you think does what you need it to do flawlessly? 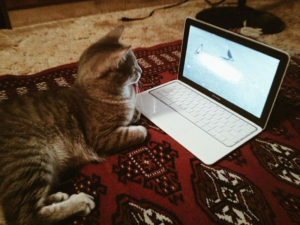 In your opinion – is there a cat proof couch out there? What do you think comes the closest? Would love to hear your thoughts on this topic in the comments down below! We have a bonded leather lazy boy couch that has held up very well to claw traffic. Although I don’t like using animal based materials, it has done fine. It is slightly textured. I think they might have a similar non leather fabric now. Would like a new couch but don’t know what other options are best to replace it with for 4 cats in the house. So many cats! I have two now, and I’m getting used to closing the door on the new “regular” fabric couch we just bought, so I can monitor the cats’ use of it. The poor thing is not going to hold up to scratches, I can tell. I think I’m going to stick to velvet fabrics at this point, as luckily the “accidents” in this household aren’t as frequent in number as I they were last month with the new fur baby (finally resolved the vomiting thankfully! ), and I think velvet is probably still the best for potential scratching. Good luck, and so glad your leather lazy boy couch held up! The problem with leather is that it is extremely expensive and almost impossible to find a totally covered leather couch. Most companies put the leather in the areas that humans touch and use the leatherette on the rest. my cats love to scratch the arms and back and top edge and none of these are leather, only the sitting leaning and leg area. I paid 3900 for a couch and love seat, not expensive but not the cheapest either. no luck. need to replace after 2 years. I am considering trying outdoor furniture! not as comfortable for humans, but….. Your point about the leather only being in areas humans touch, and leatherette being used on the rest is a really excellent point. I guess I didn’t think about it since most of the couches I’ve had Avery on/around have been really old ones, and I do think they were made differently back then. Please let me know if you do manage to snag something that works – even if it’s outdoor furniture. I honestly wish they made more claw proof sofa options. IKEA needs to get on this, because a lot of us would buy them. Any ideas for a cat pulling up threads of fine rugs? I have 2 very expensive rugs (one a Ushak that has larger weaves and another turkish wool rug. I can’t put tape all over them! HELP! put toenail covers on the cat every 6 wks or so. If you can’t do it, ask your vet or groomer to do it for you. may be worth the money. This is a really frustrating & tricky one. My mum’s cat Walker used to do it all the time, actually only stopped when he bit off all the threads on the ends. I suppose my only advice is to keep the expensive rugs in areas unfrequented by your cat? Though honestly he may go looking for them! Please anybody with tips for Ginger, chime in! I understand. I have microfiber furniture and my 2 cats have punctured the material with their back claws. So microfiber is not good to have with cats. I’m beginning to think that a tweed type material might be better. Snags hopefully can be repaired better than holes! Currently I have covers on the top of my furniture to hide the holes and to prevent more damage. I was using towels or a blanket. If you give tweed a try, let me know what you think! Would be happy to re-adjust this list if there’s anything out there that works better. I would just like to say that the idea of leather being the number one choice is way off. I had a beautiful brown chocolate leather loveseat that was given to me, for free, that my cats ruined. The cushions have barely been set on because they over took it sleeping on that at night,with a cat bed, What they do is they play and chase each other and it pours on my furniture from their bed. I also have two expensive leather electric recliners that over the last six months have been slowly scratched upon by the cats. My cats are strictly indoors and do not go outside but the vests I have seen will not remove their back claws, which is fine, I understand that. When I’m saying is I refuse to keep buying furniture because my cats are destroying it. I’m trying to find another kind of material for just a small sheet to replace the loveseat that is resilienT compared to what I had. Please email me with any ideas of finding something locally. It sounds to me like you ended up with cats that like to scratch leather. Not every cat is like this, though some definitely are. I don’t think you should risk buying new human furniture in case they do the same to fabric couches. I’ve written up a guide with as much info as I could think up relevant to cats scratching leather sofas, it’s here. I do hope something (or a combination of things) in that guide can help. Hi there. I too disagree re leather. I have leather dining chairs which are wrecked and my last cat destroyed a leather sofa. If they scratch it there are pitt holes left and scratch marks tear the leather. Whether it’s real leather or faux cats love to scratch it in my opinion. I had my furniture made, I designed it, chose the fabric and it was cheaper than buying from a sofa store. The fabric is Luke a very tight chord… not velvet finish, more like a tight cotton. It is totally cat proof and because it’s not a light colour any stains are easily cleaned. Ive jut had a furniture cleaner come and clean them as my cats have decided to take up peeing, and they also came up beautiful. There is a product out there. Hi Amanda! Could you give us some more information about the type of fabric you have – for example if there’s a product listing or maybe a shot of your fabric so anyone curious can look into what you mean? Really happy to update this list if there’s a better solution out there. I have to whole-heartedly agree with your statement about leather being a horrible idea. A cat actively clawing at the furniture is one thing, but just a cat jumping or walking (or running) on leather will cause punctures/damage. My leather furniture suffers most on the top and arms where the cats jump or run. I repeatedly see this factor disregarded in advise about materials for homes with cats.